Before you may decide to participate in the trial, it is important that you understand the purpose of the trial and what your participation will include. After we have established contact, you will receive the participant information, which we kindly ask you to read carefully and discuss with your family and maybe your doctor. If you remain positive about participating in the trial and fulfill the inclusion criteria, you will be invited to an out-patient visit at the hospital where you will receive detailed information, and you can ask any questions you may have regarding the trial. You are welcome to bring a family member or a friend with you to this visit. Afterwards you take the time necessary to decide whether you would like to participate or not. If you decide that you will participate in the trial, we will ask you to sign a consent form. This consent form is not definite and can be withdrawn at any time. To participate you are not allowed to have been previously diagnosed atrial fibrillation and you cannot participate if you recieve anticoagulation treatment (in this context aspirin is not considered as anticoagulation treatment). You have to be able to get to the necessary controls at one of the participating hospitals. Unfortunately we cannot provide you any travel costs reimbursement. If you would like to participate, you can find contact information in the text under: contact us. You are also welcome to contact us if you simply want more information or have any questions. 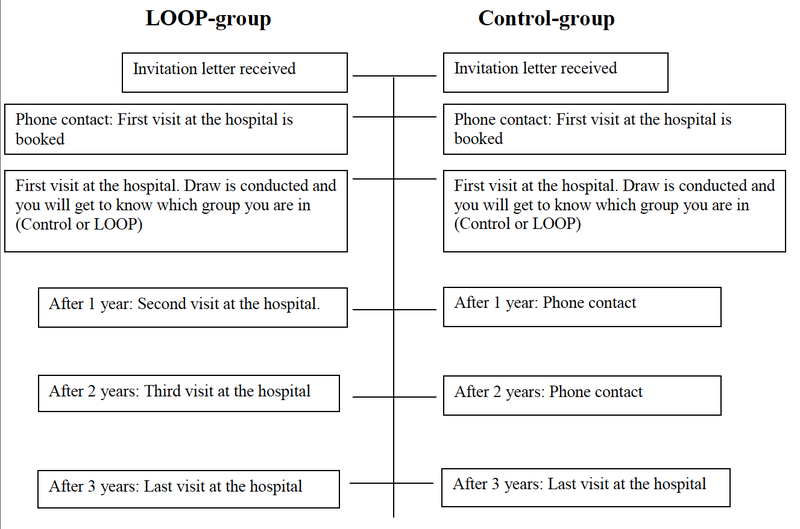 The trial will include 5 visits at your hospital over the next 3 years for the group that will have a loop recorder implanted (LOOP-group) and 2 visits for the group that will not have a loop recorder implanted (Control-group).